Despite Timothy McVeigh’s guilty verdict, numerous unanswered questions about the murderous Oklahoma City bombing remain. Indeed, there are so many unanswered questions, it is amazing that the prosecution was able to secure a conviction at all. So pull up a front-row seat for the McVeigh lynching, folks, and contemplate a few of the contradictions in the official account of the OKC bombing before it all gets flushed down the memory hole. 1. If the bombing of the Alfred E. Murrah Federal building in Oklahoma City was a terrorist reprisal for the Federal massacre of the Branch Davidians at Waco, why were no BATF or FBI agents injured? Why was EVERY BADGE-CARRYING FEDERAL AGENT absent from work at nine o’clock on a weekday morning, their offices staffed only with civilian clerical workers? 2. When the word first got out that no Federal agents had been present in the building, the BATF produced its Resident Agent Alex McCauley who told a long story about his own heroism and that of a fellow ATF man who allegedly fell three floors in an elevator, walked away from it, and then helped rescue others trapped by the bomb. This was quickly exposed as a fabrication in an angry interview by building maintenance supervisor Duane James, who described McCauley’s story as “pure fantasy”. James examined the elevator in question and also the central control panel and pointed out a number of technical and logical reasons why the miraculous elevator incident simply couldn’t have happened in the way claimed. The McCauley account was quietly retracted and flushed down the memory hole by the ATF, with the help of the media. They now admit that McCauley was nowhere near the building when the bomb went off, although they refuse to discuss his exact whereabouts or the whereabouts of any other ATF agent at the time of the explosion. Will BATF Agent Alex McCauley be disciplined for telling a self-serving lie which falsely made himself out to be a hero? If that was not the purpose, why did he make this palpably false public statement? 3. Why was U.S. Judge Wayne Alley, whose office was located in the Federal building, warned several weeks in advance in a Justice Department memo to be prepared for an unnamed “terrorist act” directed against the Federal building? 4. Judge Alley made the above admission to the Portland Oregonian immediately after the bombing. He has since refused to repeat it or allow himself to be interviewed again. Why? 5. Why did Ken Stern fax warnings to Federal judges and officials, legislators, and prosecutors warning of a possible attack on a government building or installation on the second anniversary of Waco on April 10th, 1995, nine days before the OKC bombing? “Norma” has since quit her job, gone into hiding and refused to speak again to any reporters or investigators. So have a number of other people who saw the heavily armed and equipped bomb squad in the area up to three hours before the blast. Why? 7. Why did all mention of the facts outlined in questions 1 thru 6 disappear from the news media after the first week of coverage of the bombing? Why has the media consistently suppressed and refused to report any information or evidence which indicates that, at the very least and regardless of who was responsible, there was Federal foreknowledge that the bombing would take place? 8. By definition, a terrorist must take credit for his violence, or else there is no compelling reason to commit a crime. The specific purpose of terrorism is to gain a political end through the credible threat to commit future acts of violence. No one has claimed credit for the Oklahoma City bombing. Militia and right-wing groups, the alleged masterminds and presumed beneficiaries, have been particularly vehement in denouncing the explosion and in many cases have cooperated directly with Federal agencies to absolve themselves of any involvement. The only statement of alleged political motive comes from the very government which was attacked. Why is this? 9. Did the Alfred Murrah building warehouse documents relating to the attack on the Branch Davidians at Waco? If so, what happened to those documents? Were they destroyed? If so, were any copies kept elsewhere? If not, why not? 10. Will the missing papers, if any, affect former Attorney General Ramsey Clark’s lawsuit against the ATF and FBI on behalf of the Branch Davidian survivors? 11. Why did the Director of the University of Oklahoma’s Geological Survey, Dr. Charles Mankin, tell the media that according to two different seismographic records there were TWO blasts, the second approximately eight seconds after the first? 12. The news media initially reported that there were two explosions, based on eyewitness testimony. Why did this version of events disappear from print and the air waves within twenty-four hours? 13. According to the prosecution, McVeigh used an ANFO (Ammonium Nitrate and Fuel Oil) bomb to destroy the Alfred P. Murrah federal building. McGyver makes it look real easy on TV. But according to Department of the Army and Air Force Technical Manual No. 9-1910, entitled Military Explosives, ANFO requires a greater than 99% purity of ammonium nitrate, as well as a specific dryness, before it can be mixed with diesel fuel to create an explosive substance. The manual further spells out that even under ideal conditions (not often reached even by experts) 4,800 pounds of ANFO explosive would create a much smaller crater than the one left in front of the Murrah building, and its shock wave could not possibly wield the force necessary to compromise the building’s concrete support structure. The FBI claims that the ANFO charge was made from 50 bags of fertilizer. Ammonium nitrate fertilizers comes in much weaker concentrations than the 99%-plus required for explosives. Creating concentrated amounts of ammonium nitrate is quite complex, and would require many bags of fertilizer. In short, according to the government’s own textbook, the Oklahoma City bombing COULD NOT HAVE HAPPENED IN THE WAY THE FBI SAYS IT HAPPENED. IT IS A PHYSICAL, CHEMICAL, AND THERMODYNAMIC IMPOSSIBILITY. Why is the FBI lying? 14. Retired Air Force Brigadier General Benton K. Partin, former commander of the Air Force Armament Technology Laboratory, a 25-year expert in the design and development of bombs, urged Senators and Congressmen to delay the destruction of the Murrah building site. 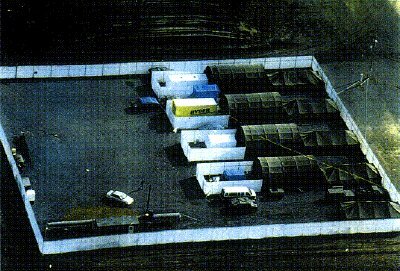 Partin stated in a news release, “When I first saw the picture of the truck bomb’s asymmetrical damage to the Federal building in Oklahoma, my immediate reaction was that the pattern of damage would have been technically impossible without supplementary demolition charges at some of the reinforced concrete bases inside the building, a standard demolition technique.” Partin further explained that “reinforced concrete targets in large buildings are hard targets to blast. I know of no way possible to reproduce the apparent building damage through simply a truck bomb effort.” General Partin’s request to have the bomb site preserved in order to examine the possibility of a second explosion was ignored by the government. And in fact, when the request was made by General Partin, the government moved up the demolition by two weeks! Why? 15. General Partin’s press release, quoted above, was reprinted in the John Birch Society magazine New American. Based on this the news media launched an egregious and bogus smear campaign against General Benton K. Partin, claiming falsely that he was a member of the John Birch Society and therefore a “right-wing extremist”. [General Partin’s report has been widely circulated and reproduced.] General Partin has been forced repeatedly to threaten lawsuits in order to obtain grudging and deliberately downplayed retractions and corrections of this allegation. His alleged JBS membership still appears in print and broadcast media today as fact, even though the media are by now perfectly well aware that the allegation is false. Why are the news media telling a deliberate lie in order to discredit a highly respected expert who questions the official government version of Oklahoma City? 16. There have been repeated studies done by a variety of accredited explosives experts and professional demolition contractors, such as former FBI agent Ted Gunderson. All of these have stated their professional opinion that the destruction of the Murrah building could only have been accomplished with top-grade military explosives, detonators, and careful placement of multiple charges. Why have the media ignored these expert opinions? Why, indeed, have the media engaged in a concerted campaign to abuse, vilify, discredit and marginalize as a “crank” or a “right-wing extremist” any explosives expert or engineer who questions the official FBI version of the bomb’s construction and explosive power? 17. There is not a single piece of concrete evidence to connect either Timothy McVeigh or Terry Nichols to any militia or right-wing group. Why has the news media refused to acknowledge this fact and continued to spread the patently false assertion that McVeigh was a member of a militia group? 18. Terry Nichols has been married twice, once to a Mexican woman and once to a Filipino. Obviously, a man who marries women of colour not once but twice and has children with them can hardly be called a racist. Why has this fact, which clearly precludes any racist or neo-Nazi involvement in the bombing of the kind implied by the media, not been given any significant exposure at all? And why has the media ignored connections between the Oklahoma City bombing and the very real, very racist Elohim City compound in Arkansas, not to mention Andreas Strassmeir, grandson of one of the founders of the Nazi party in Germany? 19. Having allegedly just committed a coldly calculated, carefully and meticulously planned mass murder, why did Timothy McVeigh then suddenly turn into a Clouseau-like klutz and do everything but send up a flare to draw attention to himself? Why did he go speeding out of the state at almost 100 mph in a yellow car with no license plate, virtually guaranteeing that he would be stopped? 20. Timothy McVeigh is a highly trained combat NCO who won a Bronze Star for courage under fire in the Gulf. Having been stopped by a state trooper, being armed with a pistol, and knowing that he now faced either execution or imprisonment for the rest of his natural life, why did McVeigh make no move at all to defend himself or escape, instead surrendering like a little lamb? 21. FBI agents are said to have tracked down McVeigh’s truck rental agency by finding a vehicle identification number (VIN) on the truck’s rear axle. This axle was found either in the bomb crater, according to the mayor of Oklahoma City’s initial press statement, or three blocks away according to the later FBI version. Which statement is true? 22. There is another problem to the Ryder truck tale. No rear axle on any vehicle manufactured in America is imprinted with a VIN, even after recent legislation forcing manufacturers to place multiple VINS on the engine, firewall, and frame to discourage chop shops. When queried, a spokesman for Ryder told reporters than it does not imprint additional VINS on its trucks. The only conceivable number available on a rear axle is a part number, but a part number couldn’t lead to the identification of a specific vehicle. We have here another case where the FBI version of events simply COULD NOT HAVE HAPPENED in the way the Bureau claims it happened. Where did the VIN story come from? Why has it been created and circulated by the media? 23. Did McVeigh use fake I.D. or his real I.D. to rent the truck? The FBI has relayed both stories as being true. 24. The FBI detained and interrogated Timothy McVeigh’s young sister Jennifer and Terry Nichols’ twelve year-old son. They announced in the media that both of them were suspects and that Jennifer McVeigh was facing indictment and the death penalty. These charges later vanished, and both young people were released. While undergoing harsh FBI interrogation, Jennifer McVeigh was exposed to projections of shocking, graphic images of bombing victims. What is the story here? 25. Who is John Doe Number Two? Does he exist at all? The FBI first conducted a nationwide manhunt for JD-2 over a period of several weeks. Then they claimed that a U.S. Army soldier on leave, whose published photographs bear no resemblance whatsoever to the photofits, was JD-2. Then they claimed for some months that JD-2 does not exist, and that all the witnesses who saw him were mistaken. Now they are hedging again and say they have an “open mind” about whether John Doe Number Two exists. What’s the deal? 26. In January of 1996, National Public Radio broadcast a half-hour special containing interviews with half a dozen witnesses who personally saw John Doe Number Two in the Ryder truck with Timothy McVeigh on the morning of the bombing. These witnesses all had one thing in common; other than a cursory preliminary interview by the FBI they had up until that time been approached by neither the prosecution nor the defense to appear as witnesses at the trial. Why not? Will any witnesses who saw John Doe Number Two be called to testify? 27. In the summer of 1995 a mysterious American named Daniel Spiegelman was arrested in the Netherlands for trafficking in stolen diamonds and antiques. In July of 1995 the Janet Reno Justice Department quietly applied for Spiegelman’s extradition to the United States IN CONNECTION WITH THE OKLAHOMA CITY BOMBING. This was accompanied by representations at the highest level demanding that the Netherlands courts hear the case in camera and that the proceedings be kept completely secret. Through his attorney Spiegelman fought extradition, a Dutch judge refused to impose secrecy on the hearing, the media got hold of it, and Janet Reno allegedly withdrew the extradition request, whereupon the entire bizarre episode vanished from public view. No more media blackout in the OKC case has been more pervasive than the blackout imposed over the name of Daniel Spiegelman; it is as if he has stepped off the face of the planet. Who is Daniel Spiegelman? What connection does he have with Oklahoma City? Is he John Doe Number Two? Does he know who John Doe Number Two is? 28. FBI informant and star witness Michael Fortier, who admits to trading his testimony for lenient sentencing on gun charges himself, claims that he and Timothy McVeigh scouted out the Murrah building several weeks in advance looking for the BATF offices therein. If that is true, why did Timothy McVeigh stop the Ryder truck at a gas station on the morning of the bombing and ask directions to the building? And why did he park the truck on the side of the building the farthest away from the BATF offices, when there was an available parking lot which would have placed the truck bomb almost directly under the seventh-floor windows of the BATF? 29. Why was the reaction of the Clinton administration, blaming right-wing radio talk shows for the incident and demanding the most draconian police state legislation ever proposed in the United States, so swift and obviously organized? The air of orchestration about the entire government response did not escape notice even at the time, and was commented on by a number of observers across the political spectrum. A blizzard of OKC-inspired “domestic terrorism” bills were rushed into Congress in a matter of days, some of them pre-written and already printed up BEFORE THE BOMBING. These proposed laws cover everything from banning virtually all privately owned firearms to unlimited and court-admissible Federal wiretaps to censorship of the Internet to the suspension of habeas corpus in “terrorism” cases to the grotesque destruction of the First Amendment advocated in Charles Schumer’s bill H.R. 2580, which imposes a five-year prison sentence for publicly engaging in “unseemly speculation” and publishing or transmitting by wire or electronic means “baseless conspiracy theories regarding the Federal government of the United States”. Who decides what is a “baseless conspiracy theory”? Why, the very same government, of course. How was a normally cumbersome, inefficient, and glacially slow legislative branch able to move so quickly, so comprehensively, and so efficiently in introducing these laws which will strip Americans of what remaining freedoms they have? 30. Why did it take so unconscionably long for the trial of Timothy McVeigh and Terry Nichols to begin?